This made me stop while riding my bike down Queen Street on Monday. 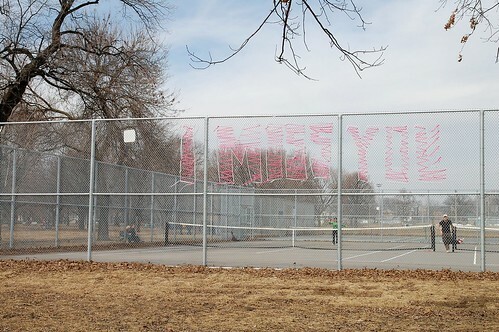 I guess someone was really missing someone else in Trinity Bellwoods Park. Sweet. Can I pretend that it is Toronto saying it to me and Dustin? We miss you too! That’s one of the few things I miss about living on that side of town – there was always something new to see – some new little guerila art project tucked away in some corner. That and claffuti’s chocolate almond croissant. There’s a giant red heart painted at the intersection of Bedford and Prince Whatever that appeared right after Valentine’s Day. 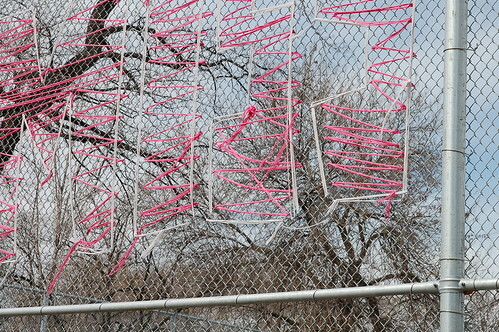 I wonder if some romantic person put together a few large scale love messages across the city, or if it was different people. I remember at Dundas St West before Brock St. There used to be a sign by the body shop that said, I LOVE YOU and it was such an amazing thig. I never took a picture cause i didn’t have a camera at the time, and now it only lives on in my memory as they changed it a long time ago. Thanks for sharing! charlotte – oh, it’s true – toronto does MISS YOU! you’ll have to start a blog to catch us up on your adventures down there. beth – i could eat one of those croissants everyday for the rest of my life! so yummy. ben – i’ll try to get a look at the heart. it would be so sweet if it was one person making grand gestures all around town. melissa – i miss you! lisa – it’s amazing how these sorts of random messages bring so much joy and stay with us for so long. Lovely post! How romantic! Thanks for sharing Karyn! i just discovered your blog through your workroom site- i signed up for the corset workshop. I am in Toronto (on Toronto Island actually) and i’ve never been to the Workroom but i’m looking forward to it. i like how your blog is a combination of your personal projects and whimsies and the Toronto craft scene.